Peaceful working ranch, close to town! Exterior view, patio and yard Four C Ranch Kitchen Den Informal Living Area Dining Room Livingroom Hallway Bedroom #1 with Queen Bed Bedroom #2 with Queen Bed Bedroom #3 with two Twin Beds Bathroom #1 Bathroom #2 Laundry Room Wildlife is common on the property, sometimes right outside your window! This herd of antelope find the views amazing, too! You won`t find this view inside city limits. Fall brings some stunning colors. Winter can be cold, but the views are worth it. No matter the season, there`s always something to see. 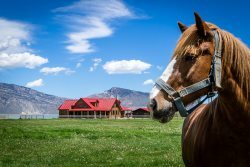 Come spend some time with us and enjoy ranch life and western living at its best! Total Sleeping Capacity: 6 comfortably in beds, 8 total. The property is even nicer in person than the pictures showed. The house was immaculate and much larger than we expected. We really enjoyed our stay! - A cleaning fee of $100 will be charged for this property.